Back Off. 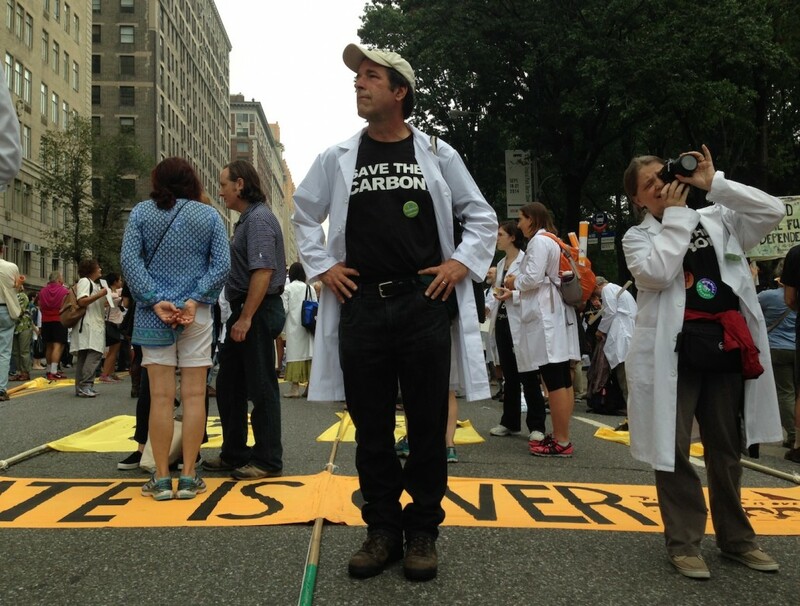 Scientists at the People's Climate March. 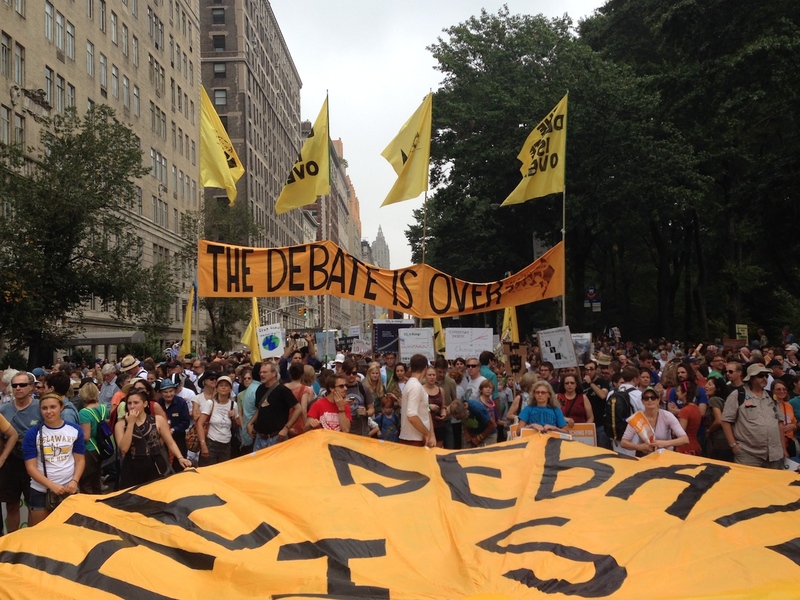 This weekend, hundreds of thousands of people marched on New York in support of action on climate change. Amongst them were a large and vocal cohort of scientists, marching under a specially organised strand of the protest, Science Stands. Save the Carbon. Scientists at the People’s Climate March. 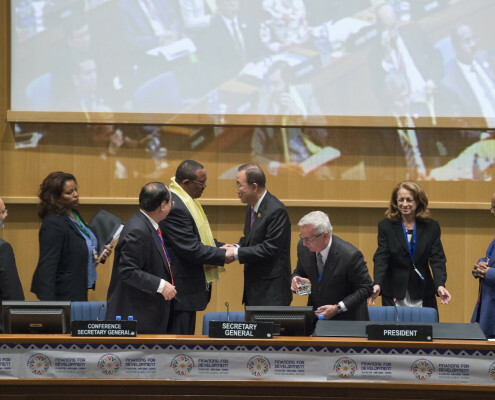 The ‘debate’ is OVER. Scientist march for action on climate change. 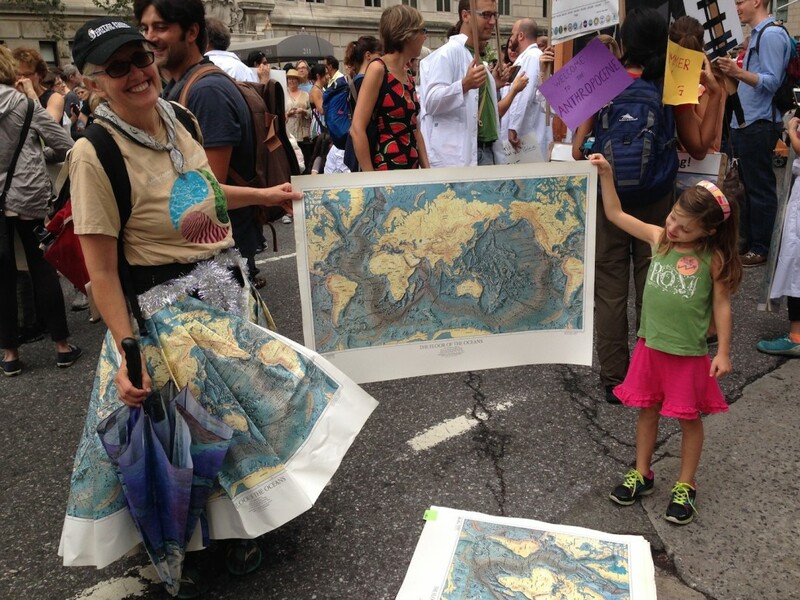 Robin Bell’s map skirt at the People’s Climate March. It’s not the first time lab-coated scientists have taken to the streets bearing graphs and equations. 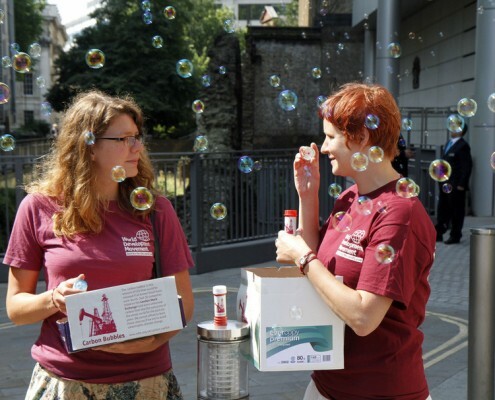 British scientists held a rally against cuts in 2010. In 2012, scientists in Canada took to the streets of Ottowa carrying a coffin to symbolise the “death of evidence”, chanting “What do we want? SCIENCE! When do we want it? After peer review!” Still, it was unusual to see a scientist bloc within a larger protest, and this did feel like a new step in terms of a more self-confident public advocacy of climate science in the political debate. Not everyone felt comfortable with the idea. Eric Holthaus had interviewed some beforehand, and IPCC vice chairman Jean-Pascal van Ypersele had said that although he was attending the climate march he “will not participate due to conflict with official IPCC roles and responsibilities” (guess he watched from the park?). Speaking to scientists at the event itself, several said they didn’t usually go on these sorts of marches, but the problem had become too pressing, they were just too fed up of politicians not taking their warnings seriously. The Debate Is Over. 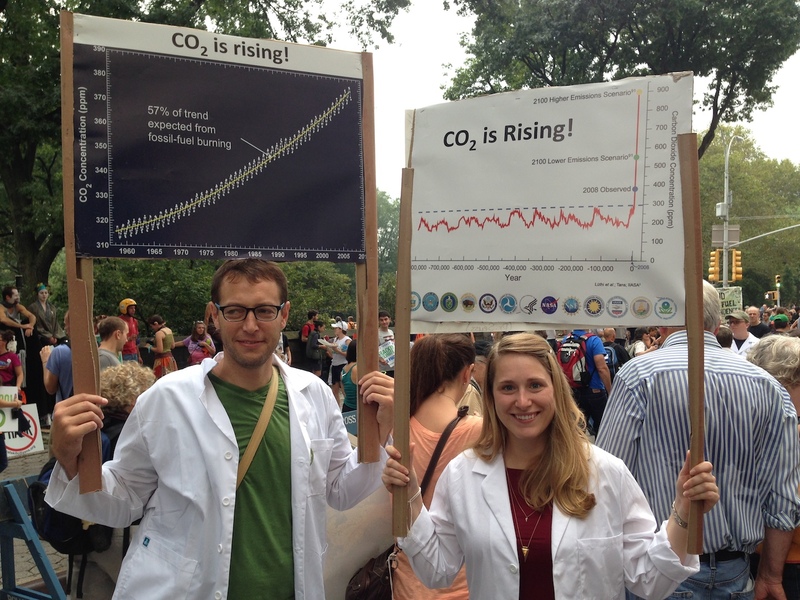 Scientists at the People’s Climate March. But it is not a framing everyone would agree with. 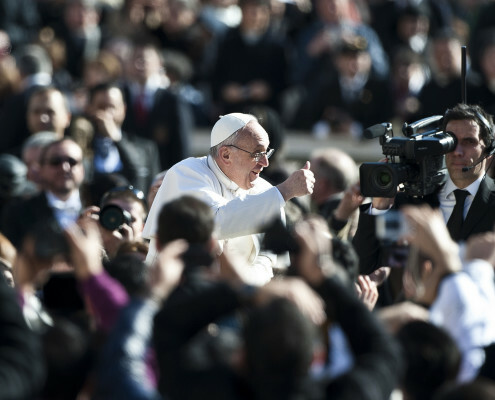 It’s too dogmatic, too top-down. 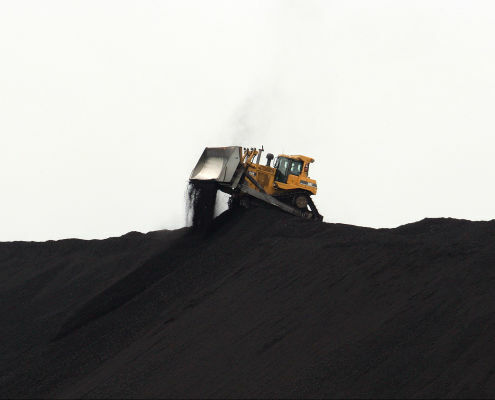 Talking to the protesters themselves, however, it seemed the messaging was very specifically aimed at people (mis)using an idea of uncertainty in science to delay action on climate change. It was a call to listen to the science, not to listen to nothing but the science. If Frumhoff really thinks climate change is all science, no ideology, the scientists at the march didn’t necessarily share such a limited view. Back Off. 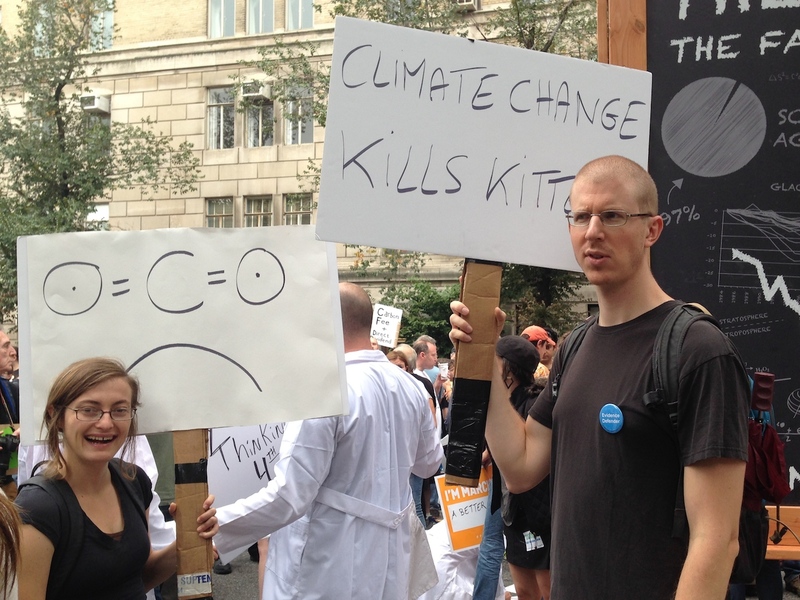 Scientists at the People’s Climate March. Climate change kills kittens. Scientists at the People’s Climate March. Indeed, behind the labcoats, there seemed to be quite a bit of diversity, and some ambiguity. Allison, one of the many local grad students in attendance, had been apprehensive of the idea at first, especially wearing a labcoat. “It sets you apart” she said, worrying that they should be mixing with everyone else, partly to talk to other people, but also because they’d be attending as citizens, not just professional researchers. 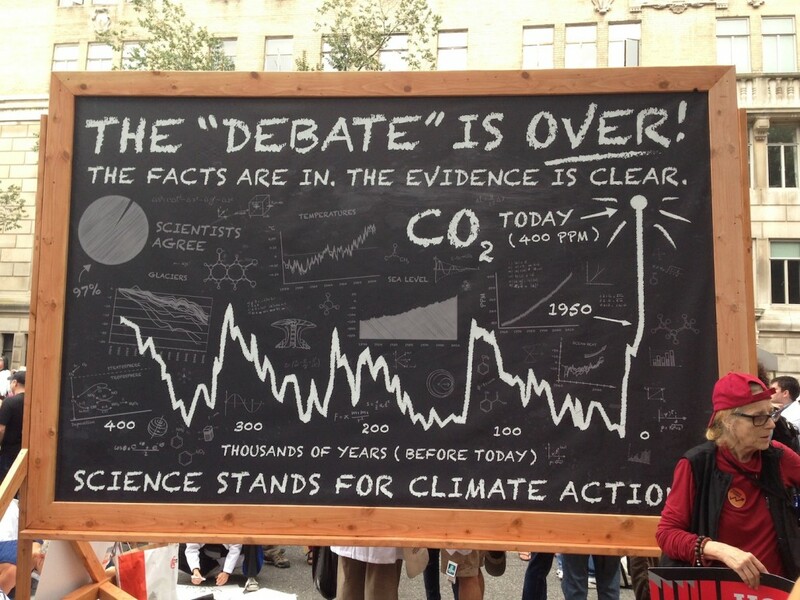 But then, with a grin, she twirled her placard around, and the graph on one was replaced with a quote from Dr Seuss. Many of the grad students brought humour, there were references to films and one chemist drew a cartoon of a carbon molecule looking sad: “It’s not his fault, he didn’t realise he was causing all this trouble”. Another, a climate scientist, had brought the “evidence-based” statement that climate change kills kittens. Several had clearly decided to march with the scientists just because that was where their friends were. 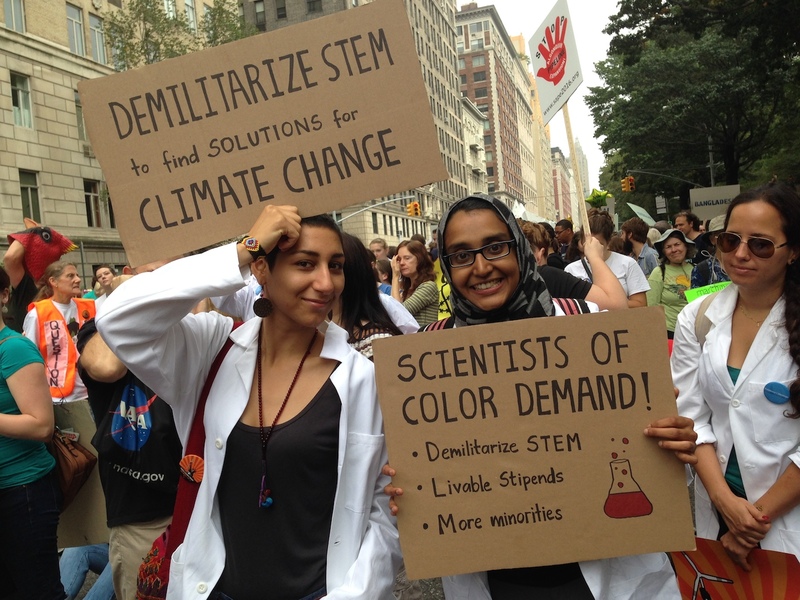 Samira, a mechanical engineering student, and Halla, studying chemical biology, brought stronger political points, with banners showing off the intersection of climate change with other issues like diversity and military funding. “How can you just do science without realising the politics of it?” Samira exclaimed. Hala, agreed “exactly, and that’s a really privileged position to come from.” They said they’d chosen to march with the scientists – as opposed to anti-war, college or NGO groups – to show off the politics within science, and possibly find others who might be interested in the issue. Also hoping to open some political debate in and around science were representatives from the Natural History Museum which opened in Queens this month, aiming to highlight the social and political forces that shape nature (and call out those museums who take money from climate sceptics). Demilitarize STEM. Sign at the People’s Climate March. In the end, the name Science Stands turned out to quite apt. Although they’d started congregating at 10am, it was after 2pm before they started moving. Less a march, perhaps, and more assembly. But the standing around gave time for discussion, joking, arguing, sharing ideas, organising and dipping in and out of other groups. The social interaction aspect of protests is sometimes forgotten, but it can often be more important than making a particular point. Moving away from Science Stands and through the full stretch of the larger march, they weren’t the only group talking about science. They weren’t even the only ones in white coats, as a cohort of doctors marched to highlight climate change as a public health issue. There were a fair few placards in support of science education, and a smattering of “geologists against fracking” signs, in several parts of the march. 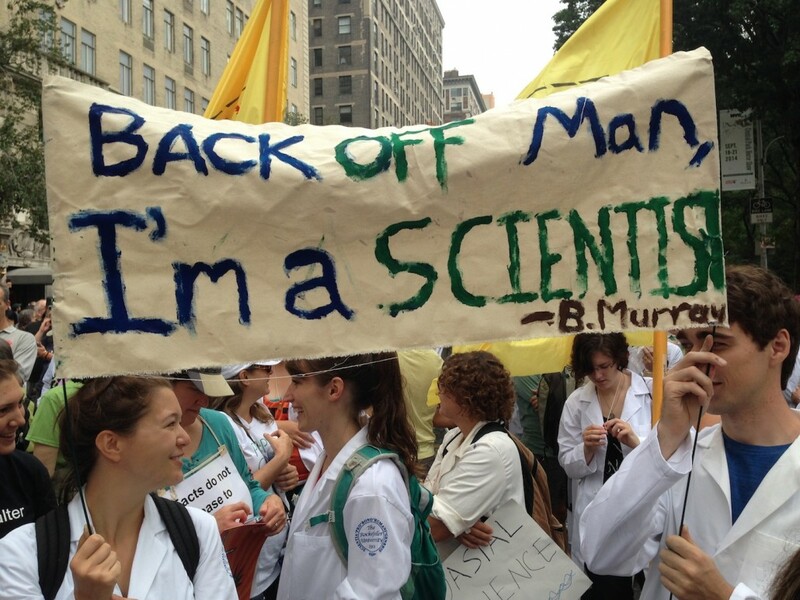 The large Canadian contingent included references to science cuts in their slogans, including on placard challenging their Prime Minister to “unleash the scientist”. Some of the Canadian science activists mixed with Science Stands, distributing a “evidence defender” badges and swapping stories of bad science policy. One of the anti-fracking groups brought an elaborate set of molecule models made from beach balls stuck together, which children too great delight in throwing at each other. I’m a FRIENDLY fusion scientist. Sign at the People’s Climate March. 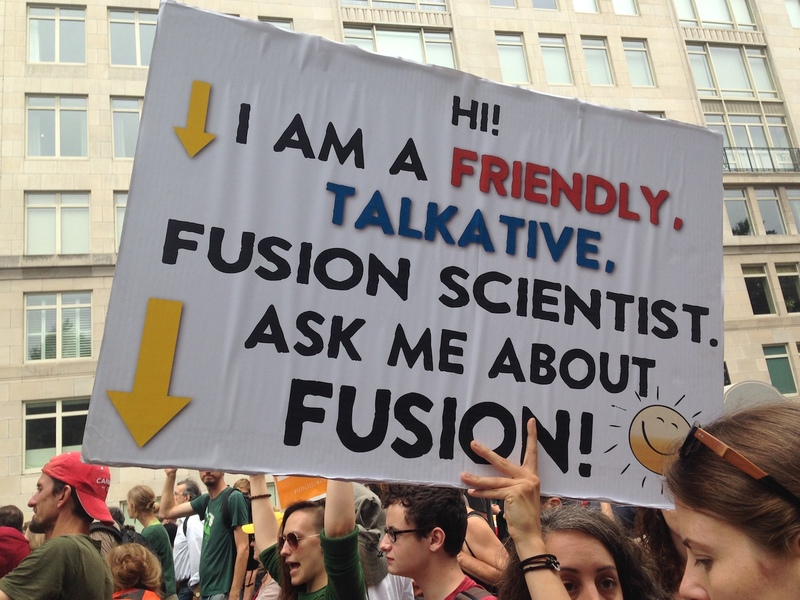 There was also a medium-sized fusion energy science group who choose to march apart from Science Stands. Angie, a postdoc from Princeton said they wanted to walk with the solutions part of the march; to integrate in a space where they could discuss their work with others. With a massive sign declaring “I’m a FRIENDLY, TALKATIVE, fusion scientist” help up high above her head, she was doing a steady business in active outreach. Whatever your views on fusion energy, maybe they were onto something there. Written by Alice Bell. Published on September 22, 2014. Last edited on July 30, 2015. 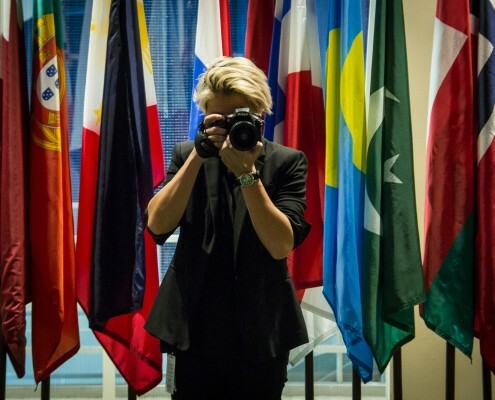 #PeopleOfClimate: A global portrait of people making a difference for clima... Is the climate debate over then?